The Sony SB-V3000 is an excellent piece of equipment for anyone that has a lot of video equipment. It allows 6 video devices to be switched in a full matrix. This means that each of those 6 devices can be switched to any of the 6 devices. This is not a simple selector that only allows you to select one of the sources and sends that to all outputs; the SB-V3000 is a true matrix. It saves you the hassle of plugging and unplugging cables all the time: now it's just a matter of pushing a button! It even allows you to select a different audio source than the video source. So you can have the video from source 1, but the audio from source 5. All of this makes the SB-V3000 ideally suited for video editing purposes and other professional applications. Once you know the features and understand the design, the SB-V3000 is relatively simple to use given it's many features. You start at the left. Each row refers to one of the six inputs. From left to right you will see buttons in the same sequence that the signal travels. It can be devided into a pre-processing stage, the switching matrix and the monitors. We start on the pre-processing part on the left. The pre-processing part allows you to alter a source before it gets to the switching matrix. The first thing you will see is two LEDs indicating the type of signal the SB-V3000 detects (see video signals below for more info). The first button allows you to enhance a composite video signals to s-video (Y/C) (see video signals for more detail). Next you have the ability to use the audio from the AUX port. This is an audio source seperate from the 6 inputs, allowing you for instance to mix music from a CD-player. The audio of the AUX port can only be used for one source at the time. The third button allows you to pass the signal through a processor, for instance a XV-C900 color corrector. This too can only be applied to one source at the time. On the bottom of this column you'll find a video and an audio button, allowing you to select what should be send to the pre-processor. After the pre-precessor buttons we arrive at the central part: the switching matrix. Here all 6 outputs have their own column. By selecting one of the columns on a particular row, the source (of that row) is redirected to the selected output (in that column). Selections are indicated with LEDs in the switches itself. For instance if all the columns on one row are selected, it means that that particular source is sent to all outputs. The matrix will be discussed in more detail below. Entirely on the right you will find the two monitor outputs. Again, by selecting a particular row, that source is redirected to the monitor you have selected (See monitor outputs below for more info). As stated, the SB-V3000 allows you to select the audio and video individually for every output. The matrix clearly shows this by means of LEDs build into the switches itself. If a source (row) is used for a particular output (column), the orange LED on the top of the position in the matrix will be lit. (The top of the button is also labelled "V" on the left). 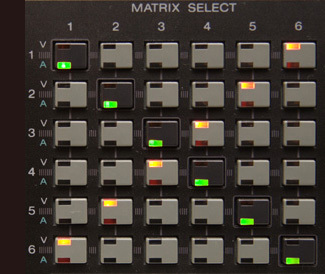 If a particular source is used for audio, the green LED at the bottom of that matrix position is lit. Because the SB-V3000 allows you to switch any of the 6 inputs to any of the 6 outputs, this allows very complex setups. 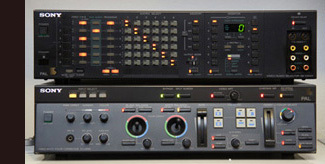 The most basic setup would be to connect 6 videorecorders in a simpel fashion: the input and output of videorecorder A to input 1, those of videorecorder B to input 2, etcetera. It is also possible to connect 6 videoplayers to inputs 1-6 and 6 videorecorders to outputs 1-6 adding upto 12 devices in total! To assist in the various setups, the SB-V3000 has 3 different "output modes". Output mode "A" is intended for the simple setup. In this case the SB-V3000 will prohibit you to send the output of source 1 to the input of source 1 because this is undesired. (This is also why these buttons are in a darker shade of gray). In output mode "C" you are fully in charge allowing you to connect any output to any input and even determine which audio and video source should be used. Set the VIDEO/AUDIO button (below the output mode switch) to type of source you want to assign and then press one of the buttons in the matrix to select the desired source for a particular output. All inputs and outputs on the SB-V3000 are s-video capable. At the back you will find the 6 inputs grouped together, the 6 outputs grouped together, an additional in-/output for a video processor (suchas the XV-C900) and auxilary audio input. Apart from the 6 regular outputs, the SB-V3000 also provides two monitor outputs. Connect a monitor to one of these outputs and you can select any of the sources to view that particular source. The two monitors can be selected individually from eachother. Monitor 1 is a SCART connector, monitor 2 is cinch + s-video. Both outputs are capable of delivering s-video quality. You can decrease the volume for Monitor 1(in 2 dB steps, indicated on a display), mute video and/or audio completely and set the audio mode (stereo, mono, left or right). For conveinience, Sony has put a full set of inputs/outputs on the front too. 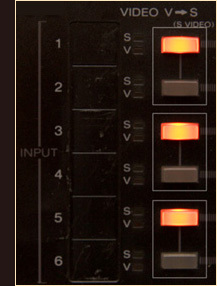 With a button you can determine to use the inputs/outputs 6 on the back or the inputs/outputs at the front. This allows you to easily connect a videocamera, a recorder or other temporary equipment. Effectively this gives you a seventh set of input/outputs. However you can only switch 6 at the time. The Sony SB-V3000 comes with the RM-3000 infrared remote controller. It allows you to fully control your SB-V3000 from a distance. This gives you the oppertunity to build in the SB-V3000, for instance on a shelf in an editing room, while still being able to fully operate it. The SB-V3000 is also equiped with a control S bus. The SB-V3000 is capable of handling both composite video and s-video signals. It recognizes the type of signal and indicates that with a LED. This allows you to "see" that there is a signal even without looking at the actual source. The SB-V3000 is even capable of seperating a composite video signal into seperate luminance/chromonance signals (Y/C). It can convert up to 3 composite video sources to s-video at the same time. Per 2 inputs only one can be converted. For example either input 1 or input 2 can be converted, not 1 and 2 at the same time. To help you reconstruct often used setups, the SB-V3000 provides 4 memory positions, storing all possible settings. The SB-V3000 also contains a "clear" button to reset all settings. To prevent accidental key presses during a recording session it provides a "mode lock" button, locking all buttons, including the remote control. no price information available from catalogs.